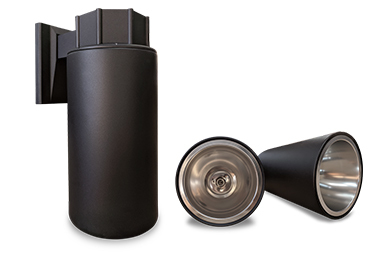 An attractive, compact cylinder that creates an elegant lighting element when installed in any architecture. For surface, pendant (indoor applications only), or wall mounting. Specify silver aluminum, white, black, or bronze powder coat finish, or custom colors are available. Seamless heavy-gauge spun aluminum cylinder. All-aluminum cylider components dissipate heat for cooler operation. Engineered with a deep socket reflector to reduce lamp glare while allowing optimal light output with reflector style lamps. Durable construction will provide years of worry-free performance even in wet locations (must specify OW option, wall mount only). Standard cylinder colors are bronze, black, white, or silver aluminum (must specify when ordering). Custom colors are available–consult factory. Self-flanged aluminum reflector prevents light leaks and is available in assorted colors. Universal mounting hub allows the fixture to be pre-installed without the housing to provide temporary lighting and prevent damage to the housing during finishing. Power cord rated for 270lbs. All-aluminum cylinder components dissipate heat for cooler operation. Deep socket reflector reduces lamp glare while allowing optimal light output with reflector style lamps. Rigid, one-piece pan construction with adjustable hanger brackets ensures years of worry-free performance. Finned, extruded aluminum heat sink socket housing dissipates heat for cooler operation. Adjustable hanger brackets with bar hangers standard. Easy-access, 14-gauge galvanized steel junction box with two snap-on covers.